It's been a hard "go" for me lately. A difficult and challenging year physically, mentally, emotionally, financially, spiritually... and so on. Most of the time I do my best to put on a brave face and leave my worry, depression, and frustration with the Lord. Most of the time I push myself to forge ahead... always trying to consider the beauty and wonder gifted to me from my generous, creative King rather than allow the horror and pain inflicted in this corrupt world to bring me down. But this week has proven especially hard for me to cope. And at this moment the enemy has wounded me to the point where I feel completely helpless, isolated, and deeply punctured by arrows of hopelessness. How I long for Christian hands to be placed on my shoulders and honest, loving prayer to shower me with the wisdom and love of the Holy Spirit working in tandem. Yes, this hour I find myself faintly praying undercover in morning darkness. Silently remembering my Father's promises as tears roll down my cheeks. Let me say that again... I WILL NOT FEAR! Because my Master is with me! His rod and staff - His promises and commands - these are what comfort me. Yes, it is right here that He has prepared a table for me - smack dab in the very presence of mine enemies at the height of these trials. Here, He anoints my head with His royal oil; so much so that my cup runs over. What a blessing to know His goodness and mercy follows me all the days of my life. What a joy to remember I will dwell in His house... in His presence forever! This morning I find myself clinging to God's faithfulness. Yes, this new morning, I choose waiting over worrying. I choose believing rather than retreating. For all I have needed His hand has provided. Through this present void, I will not fear. I will trust and obey the LORD GOD ALMIGHTY. My place has been set! My cup runneth over and over! So, I will rejoice and be glad in this new day! For His Kingdom comes and His will be done! 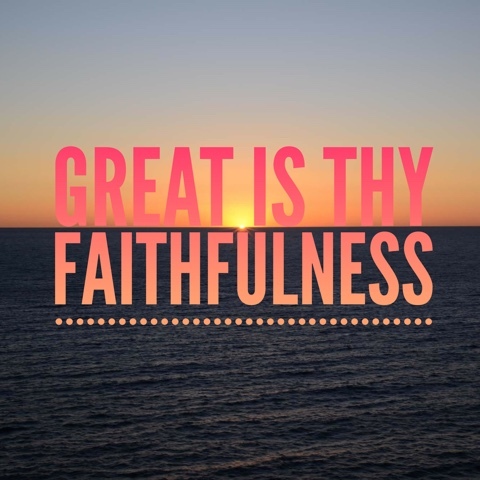 Great is Thy Faithfulness, Lord!